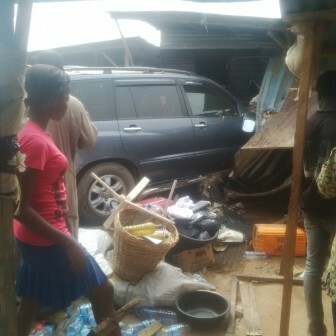 A woman believed to be in her early 30s have crushed a girl (not more than ten) to death at Obadare, along LASU-Ojo road at about 2:00pm on Friday. 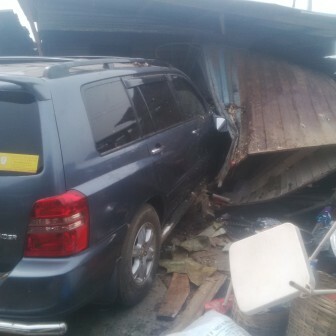 The woman who was driving a Toyota Highlander drove into a nearby market as she tried the avoid a trailer behind her and crushed the girl who was selling fish to death. PMNews gathered that the woman was scared of the persistent honking of the trailer behind her and tried to give way when she rammed into the girl. Visibly traumatized by the incident, the woman was asked to stay aside from the crowd as she continued to shake all over. The Rapid Response Squad from Igando unit arrived the scene minutes after the accident and ensured peace. 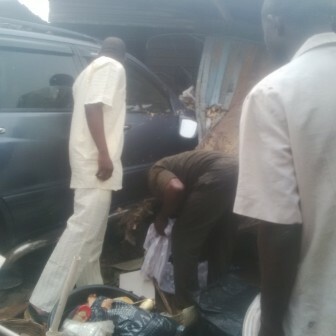 Minutes after the accident, the father of dead girl came to retrieve her body which was covered with a wrapper. The mother of the girl who also came to scene of the accident said she will not pursue the woman for the death of her child. Reading the Quran, she said she preferred to return to the mosque for prayers.